When Will Schawalbe's mother is suddenly diagnosed with pancreatic cancer, he wants to find a way to connect with her during whatever time she has left. He asks her what she's reading, and that is how their book club begins. 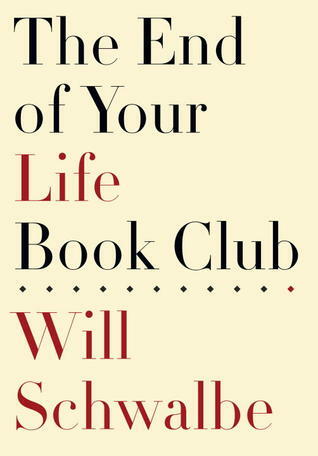 In The End of Your Life Book Club, Schwalbe tells the story of their last two years together, the connection they form through the books they read together, and the memories he has of his mother and the people she has affected throughout her life. This is a book that I read for book club, and although many of the women in the group really enjoyed it, I had a tough time getting through it. I love the concept of the story, and his mother, Mary Anne, is truly an inspiration. But I felt there was a lack of emotion on the author's part. I didn't feel a lot while reading this book, despite the fact that his mother is dying. I would have liked to see more feeling from Schwalbe, although as we discussed in book club, perhaps the issue is that he and his mother are more reserved and not so free with their emotions. Mary Anne Schwalbe, as I said above, is an inspiration with all of the amazing work she has done for refugees, and the risks she has taken throughout her life to help others. Her final work was around getting a library built in Afghanistan, and she continued to work on this project throughout her cancer treatments. She was determined to make it a reality. Schwalbe does detail the different books he and his mother read, and there is a list at the back of the book as well. But he doesn't get into too much detail about each. The books are more of a lead in to the topics he ends up discussing with his mother. I did find several new books that I'm adding to my to-be-read pile though. I think I would have enjoyed the book more had I read more of the books they discussed. Overall, this was just an okay book for me, but like I said, many of the women in my book club really enjoyed it, so you may want to at least try it out! This review was written based on a copy of The End of Your Life Book Club that I borrowed from a friend.